On a breezy and frigidly cold November day, volunteers construct the 2018 Lobster Trap Tree in Rockland. ROCKLAND, Maine ― With Thanksgiving now in the rearview, communities across Maine are kicking off the holiday season with downtowns aglow with lights and fir trees being set into place. “Anybody can bring a tree in on a truck, and they do that all over the world. But very few communities are doing what we do,” Gordon Page, executive director of Rockland Main Street Inc., said. 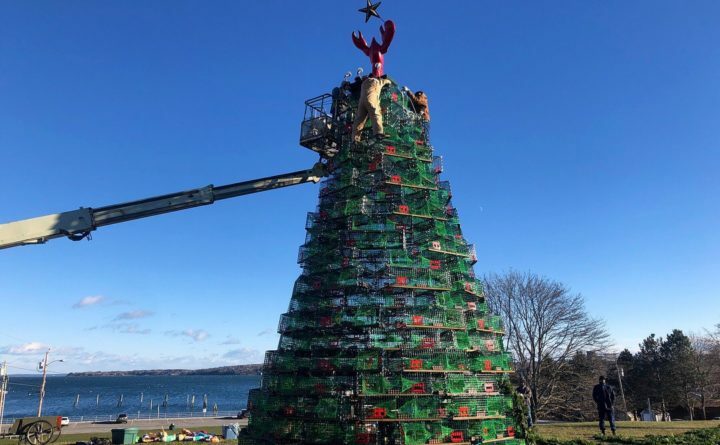 For about 18 years the lobster trap tree has been a part of Rockland’s Festival of Lights, a 25-year-old tradition that takes place just after Thanksgiving and runs through Christmas. The festival includes visits with Santa, a decorated downtown and a parade of lights that shuts down Main Street for a night. For about the last 10 years, Rockland Main Street Inc. has been organizing both the Festival of Lights and the lobster trap tree. While there was always a traditional Christmas tree in Rockland for the holiday season, early organizers of the festival wanted to do something more unique to the community. At the time the festival was being run by the former Rockland-Thomaston Chamber of Commerce, and the head of the group was inspired by smaller trap trees he had seen in other communities, Page said. With deep fishing and maritime roots, Page said the idea was an obvious fit for Rockland. “It pays tribute to the lobster fishing community and that was the original intent. Let’s not just make something that is unique, but let’s make something that is unique that has a connection to the community in some way,” Page said. The idea proved easier said than done. With only lobster traps and zip ties, a crew of volunteers had to figure out how to construct the tree without a blueprint. But over time, the volunteer building crew found a groove. For the last eight or nine years Page said that tree has been built the same way, with 12 traps at the base and a diminishing number of traps on every other layer as the tree gets higher. On an average year it takes a crew of a couple dozen people four hours to construct the trap tree and decorate it with garland, donated buoys and lights. But when the crew gathered to build the tree this year they were faced with high winds and frigid temps, causing the build alone to take eight hours, and forcing the decorating to occur on a separate day. Still, without a hitch, the tree was lit up Friday night in a lighting ceremony held every year to mark the start of the Festival of Lights. Page said the success year after year is due largely to the volunteers who turn out to help build the tree, whether they be members of the U.S. Coast Guard stationed in Rockland, inmates on work release from the Bolduc Correctional Facility, or just members of the community who want to pitch in. Since the trap tree got its start, Brooks Trap Mill, based in Thomaston, has been building the traps that make up the tree. 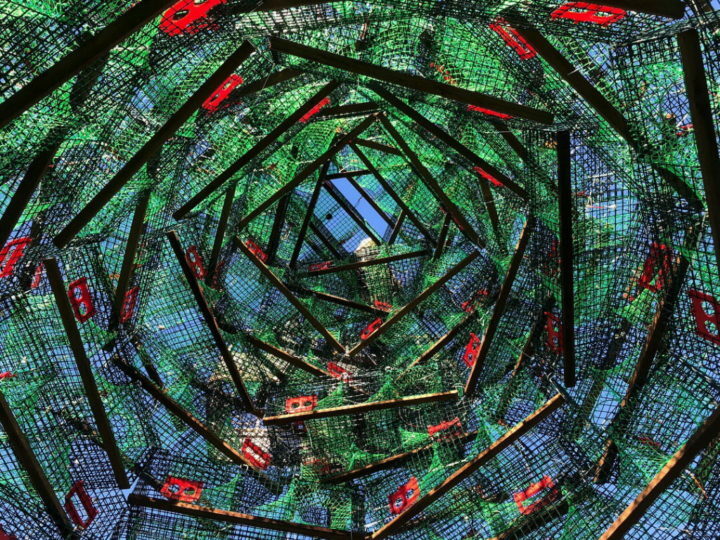 The traps are custom-built to be green and red. Since the trap orders they receive from fishermen are largely individualized, it’s not a huge deal to make 150 special traps just for the tree, Julie Brooks, a co-owner of Brooks Trap Mill said. But the traps aren’t just for show. Each year after the tree is taken down in early January, 50 or so traps are returned to Brooks Trap Mill, where they’ll be reintegrated into their inventory and sold. The remaining 100 traps will be raffled off to two people who have the option of keeping the traps to use for themselves, or receiving a cash prize instead. If the cash is chosen, the traps will return to Brooks Trap Mill to be sold to fishermen. 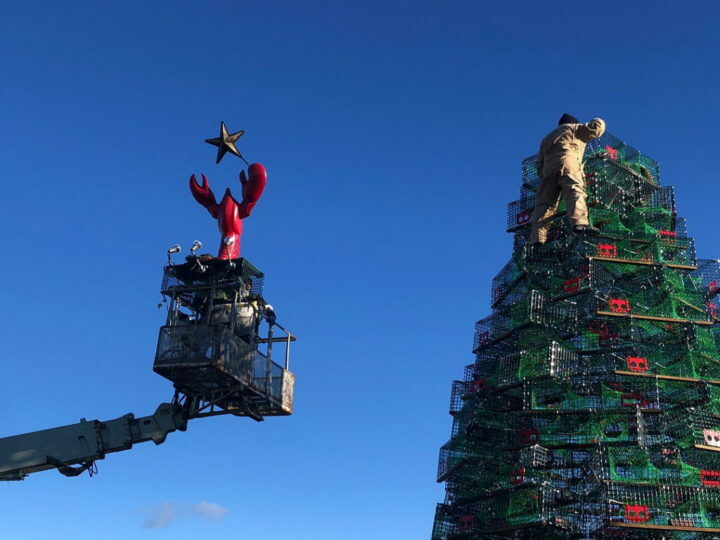 With harvesting lobster being the ultimate fate of the traps that make up Rockland’s holiday tree, it’s a true tribute to a city largely built on the industry.